Back in April of 2015, one of my author friends offered to put me in touch with her agent. She’d read the first two chapters of Plaguerunners and said it reminded her a little bit of Houses of Common. Hmm. This Derick William Dalton guy sounds pretty cool. Maybe I ought to look him up. I did. And I had questions. Let’s start with that “multi-career” track. Derick: I’ve ruled out biophysics researcher. Twelve hour days analyzing sheep urine in a basement lab through a dark Canadian winter converted my smooth, Baroque circadian rhythm to a syncopated cacophony. I really miss high school sophomores. Teaching them biology meant spending more time with them than some of their parents. Helping fight scientific illiteracy in America and mentoring teens was the most important job I’ve ever done. My current day job is an urgent care physician assistant. Mostly I treat sinus infections, but I get to fix a laceration or two every day. If I’m really lucky, I get to remove an ingrown toenail. Those days, the only difference between me and a mob goon doing some enforcing is that I inject a syringe full of lidocaine first. Gross equals awesome. Ben: Your book assumes the reader knows something about a great many things. It assumes the reader can string together prior knowledge and bits of narrative data. The jokes and culture references come fast and quick. I love it. Are you worried that readers won’t be able to follow the breadcrumbs? I know I missed a few. Derick: A little bit. But if you’ve ever read a book and felt like the author dumbed it down, you understand why I was fine with overcompensating. Not catching everything the first time? It’s fun. I’ve had to rewatch every episode of BBC’s Sherlock for the same reason, and it made me love them all the more. Ben: That’s one of the reasons I loved Houses of Common. I felt like a kid again, swimming in the deep end with Clarke and Heinlein. So. . .there was an a IKEA joke. What possessed you to put an IKEA joke in Houses of Common? Or did you just take guilty pleasure in having a bombed out IKEA in your story. How many husbands do you think have had that same fantasy? If I had my way, my house would be a smorgasbord of Swedish design and quality. IKEA’s up there with the bikeshop and bookstore in my world. When I found there is in reality an IKEA right next to the Belfast airport, I knew my Irish terraformer/refugee group had found a home. Ben: Not judging, but your experiences at IKEA . . . and with husbands and wives in general. . . may be a little different than mine. But this is my case-in-point: there was something funny and slightly offensive on every page of your book. Is the sarcasm intuitive, or did Ranyk’s character develop over several drafts? Ben: Aren’t you a Physician Assistant? You know what, nevermind. The sarcasm worked. I particularly liked how Ranyk puts himself at risk in the courtroom by pointing out the flaws in his own attorney’s arguments. The bit about ratios was especially funny. Derick: I’m not a fan of court drama. Less a fan of learning enough to write one. So I thought to myself, WWRD? What would Ranyk do? I feel like I plagiarized that scene from my own brain. Ben: I think we talked about this in February, but I’ve forgotten by now. Which end of the spectrum do you lean towards, discovery or outliner? Derick: I make a solid outline, lots of diagrams and flowcharts. Some pencil or ink sketches of spaceships and faces, too. But if I get ideas while I write, I see where they go. Captain Gill, for example, had a half-chapter cameo in the original outline. Now he’s some readers’ favorite character with his patched vacsuit, self-maintained spaceship, and oblivion to social cues. Ben: I loved Gill. Creepy and competent. What about the focus on parental figures? I haven’t read many stories in the sci-fi or fantasy genre with parents as viewpoint characters. I especially liked the lacrosse practice scene and watching Inig process his son’s performance. Why did you include that in your novel? Derick: Purely a marketing ploy. Gotta squeeze in every demographic, yeah? I’m also creating a new genre. There’s young adult and new adult fiction, so what about new parent fiction? It’s about children who sleep through the night and don’t tease their siblings and empty the dishwasher without being asked. Less flippantly, Orson Scott Card’s Homecoming Saga had a scene that stuck in my psyche. In a sequel, previously heroic protagonists were completely shackled from making attempts to right wrongs, because they couldn’t put their children at risk. It was a clever plot device in that story, but I wondered about results if they had tried. I haven’t seen many great dads in sci-fi either. I enjoyed adding one. Ben: Ok. My biggest question. Why the cliffhanger? Honestly. I mean, I know Ranyk’s future is looking up, but we still don’t know nearly enough about his political enemies or why the pirates sabatoged his project. I’d hoped for a little more closure! Derick: Yeah. . . Um, sorry? You don’t want to hear excuses, neither do all the Amazon reviewers who told me the same thing. But here’s a reason, then you all can forgive me, or not, at your whimsy: A friend put me in touch with an agent, whose first comment was, “Cut it in half.” So I shuffled scenes and reworked plot and finally put together the best ending I could without rewriting the second half of the book. After all that, the agent took a look and made a polite pass. “Never split a story,” he said. Ben: So you weren’t just being a jerk author? Derick: Lesson learned a little late. Maybe I’ll recombine the two when books three and four of the series are done. But right now I’m distracted by my YA sci-fi, which is being considered by an editor. SpaceBoots is in the same universe as Houses of Common and Meaner Sort, but occurs seventy years earlier. Ben: No harm done. I’m looking forward to reading Meaner Sort. And let us know when SpaceBoots comes out. Derick: I disagree slightly with that first sentence, I’m glad to hear the second one, and swear I’m not checking my email multiple times a day to see if a certain editor has news about the third. But yes, yes I will. In August, I took an unexpected trip to Germany and the Nordic countries. I hadn’t planned on going, but the stars suddenly aligned, and I found myself wrapping up projects and packing my bags for Hamburg. I’ll save the details for another post, but spending time with professional writers got me thinking about some of the good books I’ve read recently, and want to emulate. I generally don’t review books I don’t like, so if you see it here, there was something special about it. Feels like science fiction, but is fantasy. Magical power is traded in contracts, and even the poorest villages rely on that power. When the biggest brokers fall, wielders “Craft” are called on to patch things up before nations tumble. But sometimes the contracts are complicated, and riddled with Craft-sucking parasites that don’t go quietly. Oh, and the biggest brokers of power are the gods. I especially liked the cigarette, though I don’t smoke. Post-apocalyptic gene thriller for young adults. Partials is about surviving in a world where young adults aren’t the dominant life form anymore, about a disease that kills every newborn, and about the genetic experiment that doesn’t quite bring humanity back from the brink. There is an angsty teenager and the beginnings of a triangle, but even if YA isn’t your cup of tea, the story is pretty awesome. I’d recommend the beginning of the book for young adult readers, and the rest of the book for everybody. Houses of Commons felt like coming home. Ranyk works for an optimistic, government-run space agency hampered by red-tape and political interference. Ranyk just wants to do his job–terraform worlds for political refugees—but unfortunately, his entire team is caught in the cross-fire of conflicting conspiracies. And Ranyk’s crusty exoskeleton and sarcastic wit haven’t exactly improved the situation. 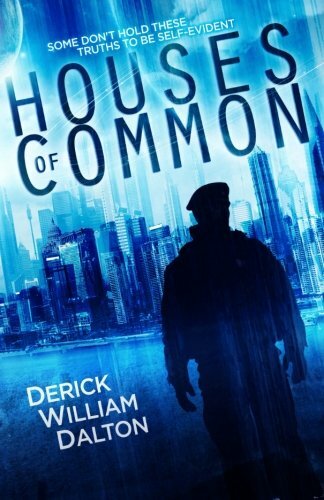 Some Amazon reviewers say Houses of Commons is “too smart,” but I really liked it. Not only was the humor right up my alley—“You named your helmet? And its name is Helmut?”—but the science is plausible and the characters well-developed. I’d recommend Houses of Common to smart people, smart-mouthed people, and people who like NASA, xenobiology, and political intrigue. My one hang-up was the cliff-hanger ending. I’ve never been a fan of cliff hangers , but the brilliant sarcasm outweighs the discomfort of having to order the sequel. Landmark Science Fiction. Commander Roderick Blaine and the staff of INSS MacArthur are tasked with first contact to an older and more intelligent alien civilization. Inexplicably, these “Moties” have been stuck in their own star system for several millennia, despite the existence of faster than light travel (Alderson drives) and shields (Langston fields). During diplomatic exchanges, the MacArthur is destroyed, leaving Blaine and his crew on a political tightrope with no “good” solutions. I loved reading The Mote in God’s Eye. Both humans and Moties demonstrate valid and persuasive competing interests. I liked both parties so much I found myself looking for a loopholes allowing each to succeed in spite of mutually exclusive competing interests. Many of the characters were equally complex, with several demonstrating both villainous and heroic agendas. I would recommend this story to everyone, but especially to those interested in landmark science fiction, efficient storytelling, and deep conflict. It’s been a crazy few months. Extra hours at the day-job reading long and contentious documents. Late nights. A whirlwind July 4th holiday. More work. As a consolation prize, I’m taking some time off and working for myself. Here’s a picture from the balcony of my new office. Ill give a free print copy of DARTS (or another of my books) to the first five people who can guess the city. Evidently I’ve been pushing myself too hard these last few weeks. A few late nights ago I was trying to put down lines of dialogue (argument) between two characters in an upcoming Paladin’s Thief book. I could feel myself slipping, my brain lying to me that I could close my eyes and type this last brilliant line without looking at anything. Or it might have been the medication talking. The Doc put me on antibiotics, heavy duty cough syrup, and some kind of prescription steroid meant to knock down the strep throat, the feverish sleep, and the general sense of temporal inadequacy. With a few minutes of soul-searching, I realized this is the exact phrase you get when you misplace your left hand exactly one row too high on the keyboard and type the following phrase. Moral of the story. Don’t do drugs, kids. Or maybe just quit while you’re ahead. Bonus points if you can guess whose line this will be, assuming it doesn’t get cut.